if you can’t share no one gets any is an exhibition by Cinenova taking place at LUX, Waterlow Park. Cinenova has invited artist Carolyn Lazard and the worker collective Collective Text to share the space of this exhibition to present work which addresses some of the barriers to the access of film and video in its production, distribution and exhibition. 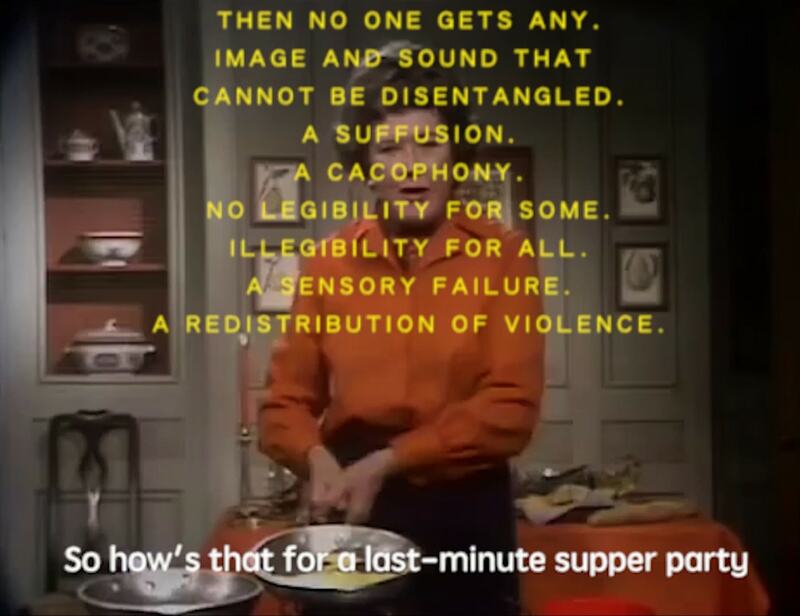 Carolyn Lazard’s video A Recipe for Disaster (2017, USA, 27 mins) uses the first programme shown with captions on US television in 1972, a cookery show, The French Chef, to compose a wider study on the terms of media accessibility. The exhibition’s title “if you can’t share no one gets any” is a line taken from the video’s compelling spoken/written manifesto-like text that, along with deadpan audio description, counter-narrates the original broadcast and casts a profound critique of inclusion as add-on or afterthought. Alongside Lazard’s video installation, Cinenova has invited Collective Text, a Glasgow-based worker collective who share skills and expertise to deliver intersectional access projects, specialising in creative Captioning and Audio Description for art and experimental film, to begin a longer-term access project for the titles within the Cinenova collection. Collective Text work in consultation with D/deaf & Hard of Hearing, Blind & Visually Impaired and Disabled artists and audiences. Collective Text will work with the following three films from the Cinenova Collection, that speak to issues around access, disability justice, and/or translation: All In Your Head by Jo Pearson, Double the Trouble, Twice the Fun by Pratihba Parmar (made with UK disability arts communities), and On The Threshold of Liberty by Heidi Tikka. Collective Text members will provide reflections and considerations specific to each film, highlighting opportunities, absences and challenges in offering access to these artist moving image works. In doing so, they hope to start conversations about what access looks like for Cinenova’s collection of films, the working group, and their various communities and audiences. Please join us for a Breakfast Opening 15 August at LUX, 9am–10.30am, for a special preview of the exhibition. All welcome. wheelchair accessible toilet facilities next door. Assistance dogs are welcome in all spaces. Carolyn Lazard (b.1987) is an artist working in video, installation, sound, and performance. They have screened and exhibited work at Essex Street Gallery (New York), Anthology Film Archives (New York), The Kitchen (New York), New Museum (New York), Wexner Center for the Arts (Ohio), The Arnolfini (UK) and the Stedelijk Museum (NL). They have published writing in the Brooklyn Rail and Mousse Magazine. Lazard holds a BA from Bard College and lives in Philadelphia. A Recipe for Disaster – Carolyn Lazard (USA, 2017, 27mins). Image courtesy of the artist.